If this were football, they’d make a movie. Then again, tiny Walkerville doesn’t have a football team. 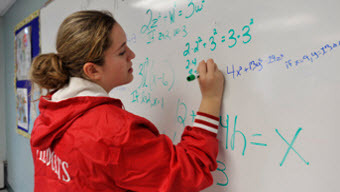 Pulling perhaps the biggest upset in Bridge Magazine’s Academic State Championships, Walkerville Public Schools, with 314 students and one of the highest rates of poverty among Michigan school districts, is the State Champion of 8th Grade Math. Not just champion among other rural, poor schools -- but against every school in the state. level or higher last year on the math section of the Michigan Educational Assessment Program, or MEAP, test. The kids were well-prepared for success by a string of good teachers and a community that values education, Adams said. But just as important was finding a way to motivate the students. “Schools are held accountable to the (MEAP) scores, but students aren’t,”Adamssaid. “It doesn’t matter if they do well or poorly, it has no effect on them." So Adams motivated his students by using a sports analogy. “When we’re reviewing (for the MEAP) I say it’s like practicing for the Super Bowl,” Adams told the kids. “We’re competing against all the other schools in the state. This is truly wonderful, to know they are at such a disadvantage and made the best of it. Congratulations to the young people and the teachers who teach them. Go walkerville! Just goes to show, poor children don't have to stay poor in learning! And may they all have a bright future ahead! Good job staff and students. I'm Walkerville alumni and in reality that school has an advantage that others don't. It is small and makes for a family atmosphere. Proud of our little town. It really does have a wonderful staff!